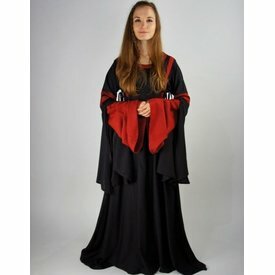 This elegant medieval style dress has a hoodie for keeping you warm, perfect for winter festivals! The side of the dress has cords for adjusting. The most striking elements of this dress are the beautifully draped black and red sleeves. With hoodie. Laces on side and back.